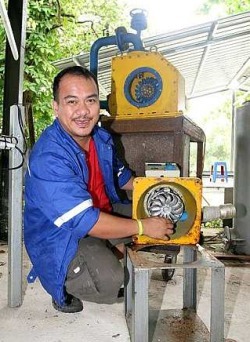 A micro-hydro system that is environment-friendly and requires the participation of the villagers is generating waves in rural Sabah and Sarawak. IMAGINE if you will, a small village in the remotest part of Sabah, where there are no roads and where the villagers are almost cut off from the outside world. Now imagine if you lived in this community and your only source of electricity is a diesel generator, and you have to go on an arduous eight-hour trek through rough terrain to get your weekly supply of diesel. Through the enterprise of an engineer self-taught in this technology, as well as the efforts of various NGOs, a wave of change has come to Sabah and Sarawak. It all started in 1999 in Long Lawen, an extremely remote village in upper Bakun, Sarawak. There are 70 households living there, and access to the village is via a logging road seven hours from the Bakun Dam. The villagers were among those displaced by the Bakun Dam project and told to relocate to a settlement. But they defied the eviction order and returned to their ancestral land.